Poor Gretchinz! Basically they are the Ork underdogs, smaller than Orks, they get all the crumby jobs no one else wants. So, it’s hardly surprising they like to let their hair down (do Orks have hair?) every so often and indulge in some fun! 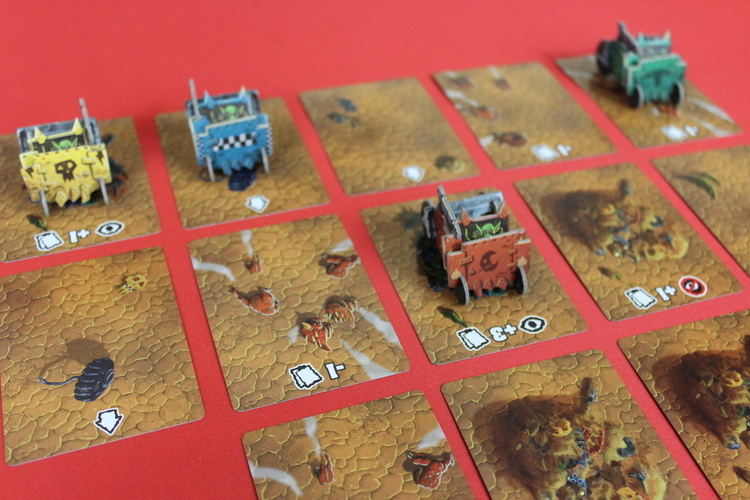 In this Warhammer 40k based game from Devir, you take on the role of a Gretchin in your pieced together, piece of junk car, racing across the wasteland whilst trying to take out your opponents. Shuffle the terrain cards and place the deck with terrain side up, place the crater cards in a pile next to it. 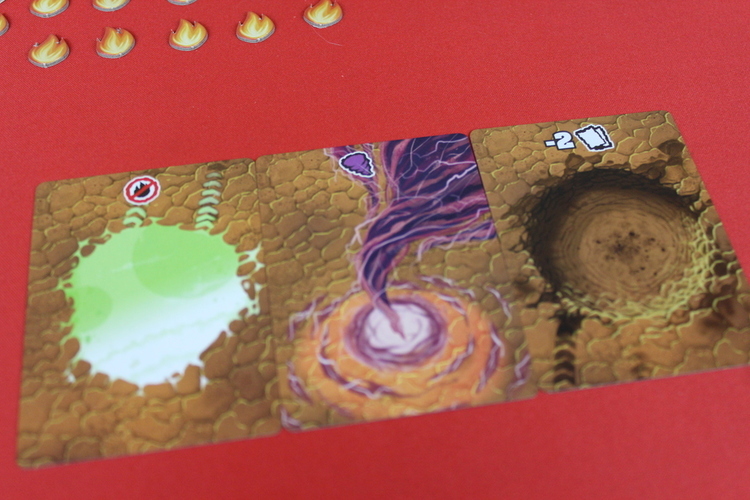 The player boards are double sided, meaning you can play with or without each klans special ability. 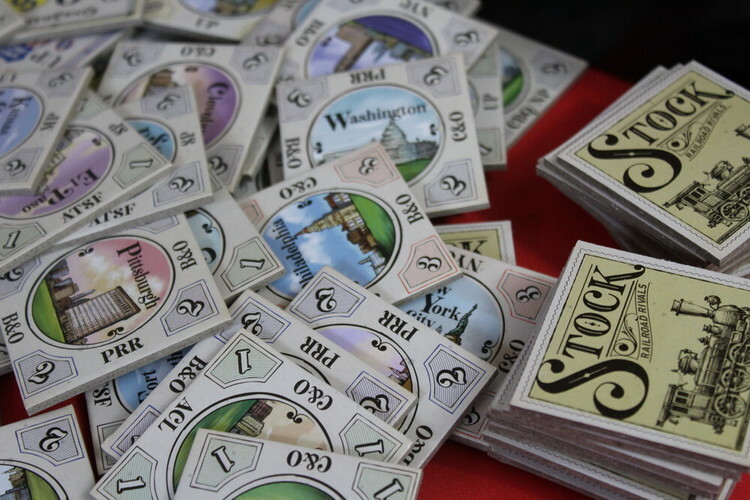 Place them with the appropriate side up, take a buggy of your chosen colour and place the matching marker into the space on your player board. Each player takes three dice and again, places them in the appropriate space of their player board. Place the vehicles randomly in a line next to each other at one end of the table. Place one terrain card in front of each buggy and on extra on each side. So, in a four player game you will have a row of six cards, three players five cards or two players four cards. Make sure you have room either side as this can easily get much wider! Finally, deal five cards to each player making sure that you only ever see the terrain side, but your opponents can see the other side - the attack side. As soon as all players are ready everyone will throw their dice simultaneously, and this is where it gets crazy! Everyone can roll or reroll as many or as few dice as much as they want to get the desired results. 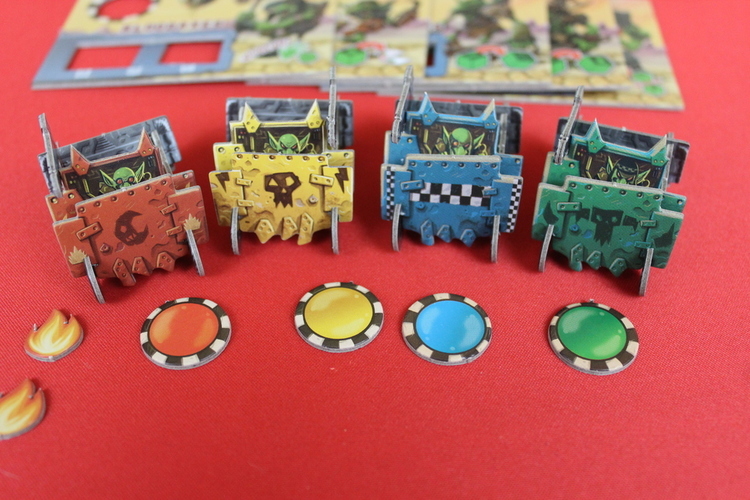 However, as soon as one player is happy with what they have and placed them in their panel, they shout ‘WAAAGH!’ and everyone else must stop rolling their dice and be left with what they have! At this point, players are allowed to hide their dice rolls and arrange them strategically without everyone else being able to see them. The player who shouted gets to have their turn first, then play proceeds clockwise round the table. So, let’s have a look at what the dice can get you! Draw Cards: Simply put, draw two cards from the terrain deck. Add them to your hand without looking at the attack side. The Eye of Mork: Ask any other player to tell you how many firing cards you have in your hand - they must tell the truth! Swerve to the Right/Left: Move your buggy to the card that is diagonally right or left. 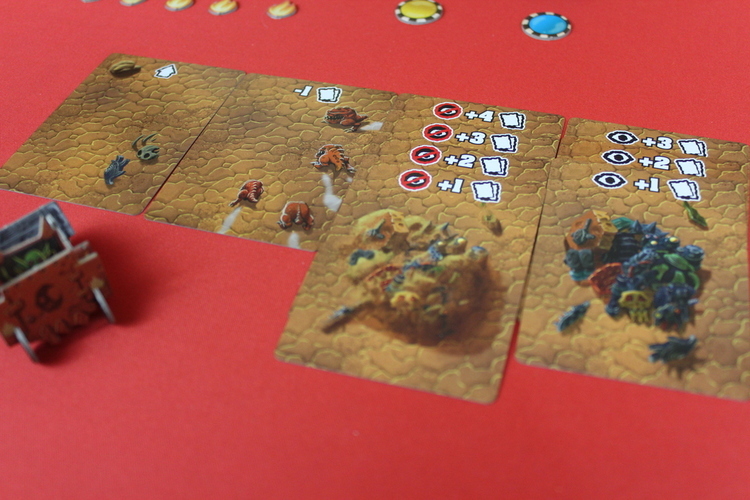 As you move you must place three terrain cards in front of the buggy. One directly in front and one on either side of that. Klan Ability: If you are playing with Klan abilities, use the action shown on your player board. Dakka: Attack another players buggy or try to destroy a terrain card. You must always use all your dice and you must use them in the order you placed them. To attack after rolling a Dakka, you can choose to attack another players buggy or a terrain card. You can make multiple attacks in the same turn, even on the same target! To attack a buggy, first declare who you are going to hit. Then choose two cards from your hand and place them, attack side up on the table. If both are Firing cards, your attack was successful, the target vehicle receives a flame token. If you revealed a Problems card, your weapon backfires on you and you place a flame token on your buggy. If you reveal an Explosion card, it all went horribly wrong, discard your entire hand. It is possible to reveal a Problems and an Explosion card, in which case, take both effects! Attacking terrain works in a similar manner, except you only reveal one card. Problem and Explosion cards have the same effect on you. If you reveal a Firing card, place a crater card on top of the terrain you attacked. Any player entering that space will have to lose two cards! Oh, and talking of terrain cards, let’s look at them! Open Terrain: Keep on truckin’ (should that be buggyin’ - not sure that works?) Just keep on moving without any problems, if you have multiple Swerve die you could potentially move three spaces with these cards. Squig Stampede: Your buggy becomes a tasty snack for wild squigs! Lose one card. Hidden Scrap Materials: Oh goody, free stuff! It’s buried under dust and dirt so you can’t quite make out what it is though. Draw the shown number of cards without looking at the attack side of the cards. Junk Materials: Oh, more free stuff! This time it’s not buried so you can see exactly what you’re getting. Drawn the shown number of cards, but this time you get to look at the attack side. Puddle: Nice cooling water (well, green slime!) This will help cool down your buggy and remove one flame counter. Warp Clouds: The Ork Weirdboyz obviously think the race isn’t exciting enough so they come along and add a bit of chaos to it! This simple spell confuses the drivers, meaning the player to hit this space gets to take one card of their choice from each opponent. If, at any point in the game, you end up with over five cards in your hand you must immediately discard down. If your poor little buggy ends up with three flame counters at any point, you must stop racing to put out the flames before it is destroyed! You must discard your entire hand and skip your next turn, if this happens mid-way through a turn just stop there. 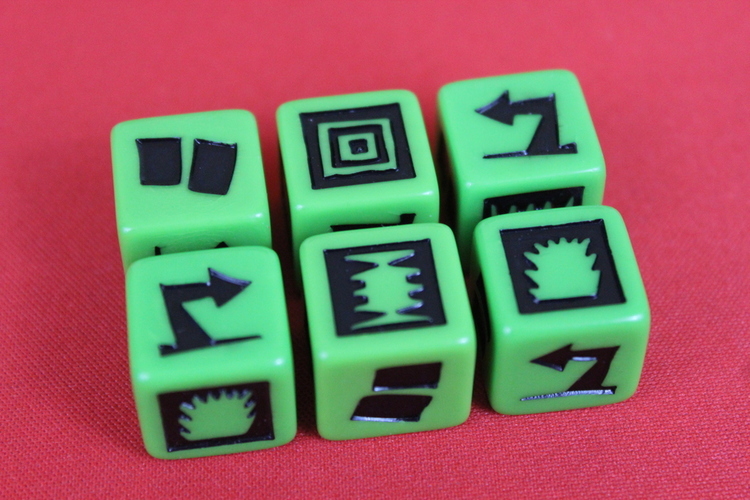 Before you roll your next dice, you can discard two flame counters and draw a card. The game ends when one buggy makes it to the seventh row of cards. The round is played out. If there is only one buggy on the last row, they are the winner (even if they have three flame tokens!) 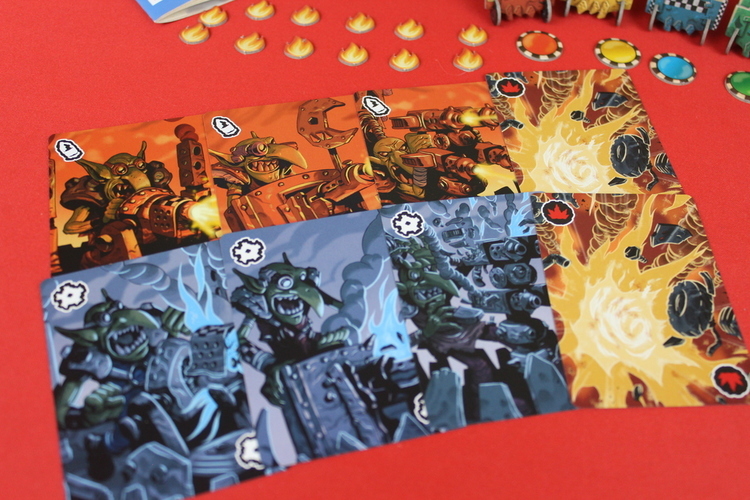 If there is more than one buggy in the last line of cards, the player with the fewest flame counters is the winner, if there is still a tie, the player with the most firing cards in hand wins as they use them all to blow up their opponent! 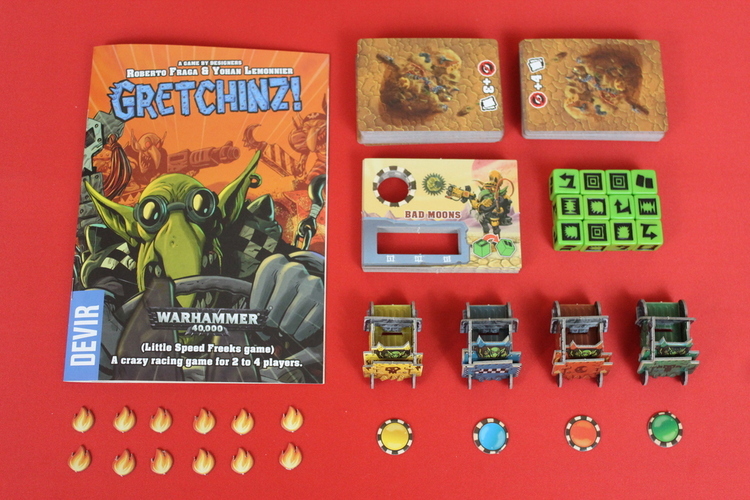 Gretchinz is a fast, fun and furious little game. The mayhem that comes with the real-time dice rolling is a small glimpse into the chaotic world of Orks. The theming is spot-on and stays true to it’s 40k roots. Certainly a silly filler for skirmish game fans.